Tributes have flooded in for the British-born author, literary critic and journalist Christopher Hitchens who has died at the age of 62. He had been suffering from oesophageal cancer. Tony Blair described him as "a complete one-off, an amazing mixture of writer, journalist, polemicist, and unique character". The author Salman Rushdie, a friend, paid tribute to him on Twitter after the announcement of his death. "Goodbye, my beloved friend. A great voice falls silent. A great heart stops," he wrote. Mr Blair, the former Labour prime minister, publicly debated religion with Hitchens in November 2010. He said Hitchens "was fearless in the pursuit of truth and any cause in which he believed. "And there was no belief he held that he did not advocate with passion, commitment and brilliance. "He was an extraordinary, compelling and colourful human being whom it was a privilege to know." Deputy Prime Minister Nick Clegg, who once worked as an intern for Hitchens, said: "Christopher Hitchens was everything a great essayist should be: infuriating, brilliant, highly provocative and yet intensely serious. "He will be massively missed by everyone who values strong opinions and great writing." The author and prominent atheist Richard Dawkins described him as the "finest orator of our time" and a "valiant fighter against all tyrants including God". He said Hitchens had been a "wonderful mentor in a way". Hitchens became a celebrity in his adopted homeland of the US after the publication of his 2007 book God Is Not Great, and he happily took on the role of the country's best-known atheist. He maintained his devout atheism after being diagnosed with cancer, telling one interviewer: "No evidence or argument has yet been presented which would change my mind. But I like surprises." He famously fell out with his brother, the Mail on Sunday journalist Peter Hitchens, though the pair were later reconciled. Writing in the Daily Mail, Peter Hitchens said that the one word that came to mind when he thought of his brother was "courage". He would always rather fight than give way, he wrote, not for its own sake but because it came naturally to him. The MP Denis McShane was a student at Oxford with Hitchens. He said: "Christopher just swam against every tide. He was a supporter of the Polish and Czech resistance of the 1970s, he supported Mrs Thatcher because he thought getting rid of the Argentinian fascist junta was a good idea. "He was a cross between Voltaire and Orwell. He loved words. "He could throw words up into the sky, they fell down in a marvellous pattern." 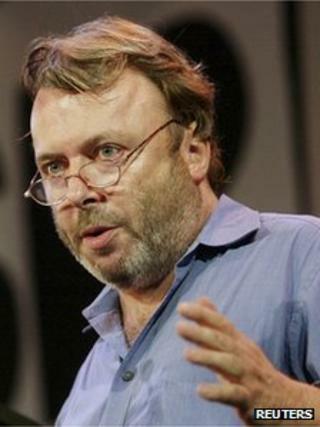 Hitchens was born in Portsmouth in 1949 and graduated from Oxford in 1970. He began his career as a journalist in Britain in the 1970s and later moved to New York, becoming contributing editor to Vanity Fair in November 1992. Media caption"Prospect of death makes me sober, objective"
He was diagnosed with cancer in June 2010, and documented his declining health in his Vanity Fair column. In an August 2010 essay for the magazine he wrote: "I love the imagery of struggle. "I sometimes wish I were suffering in a good cause, or risking my life for the good of others, instead of just being a gravely endangered patient." Speaking on the BBC's Newsnight programme in November that year, he reflected on a life that he knew would be cut short: "It does concentrate the mind, of course, to realise that your life is more rationed than you thought it was." Radicalised by the 1960s, Hitchens was often arrested at political rallies and was kicked out of the Labour Party over his opposition to the Vietnam War. In later life he moved away from the left. Following the September 11 attacks he argued with Noam Chomsky and others who suggested that US foreign policy had helped cause the tragedy. He supported the Iraq War and backed George W Bush for re-election in 2004. It led to him being accused of betrayal: one former friend called him "a lying, opportunistic, cynical contrarian", another critic said he was "a drink-sodden ex-Trotskyist popinjay". I had the uncomfortable misfortune of sitting between Christopher and his nemesis George Galloway on the Bill Maher show once. The two loathed each other so much they would not even look at me in the middle for fear of catching each other's eyes. And yet Christopher made the evening one of the most pleasant of my life when, at drinks afterwards, he told me I had never been hotter. I was eight months pregnant. After that he could do no wrong in my eyes. But he could dish out scathing critiques himself. He called Bill Clinton "a cynical, self-seeking ambitious thug", Henry Kissinger a war criminal and Mother Teresa a fraudulent fanatic. Vanity Fair editor Graydon Carter described the writer as someone "of ferocious intellect, who was as vibrant on the page as he was at the bar". "Those who read him felt they knew him, and those who knew him were profoundly fortunate souls." A statement from Vanity Fair said he died of pneumonia, a complication of his cancer. Hitchens wrote for numerous publications including The Times Literary Supplement, the Daily Express, the London Evening Standard, Newsday and The Atlantic. He was the author of 17 books, including The Trial of Henry Kissinger, How Religion Poisons Everything and a memoir, Hitch-22. A collection of his essays, Arguably, was released this year. Christopher Hitchens is survived by his wife, Carol Blue, and their daughter, Antonia, and his children from a previous marriage, Alexander and Sophia.